The International Space Station is the size of a football field and circles the Earth more than 15 times a day. But before the ISS came a range of space station concepts, many of them featured in miniature form. 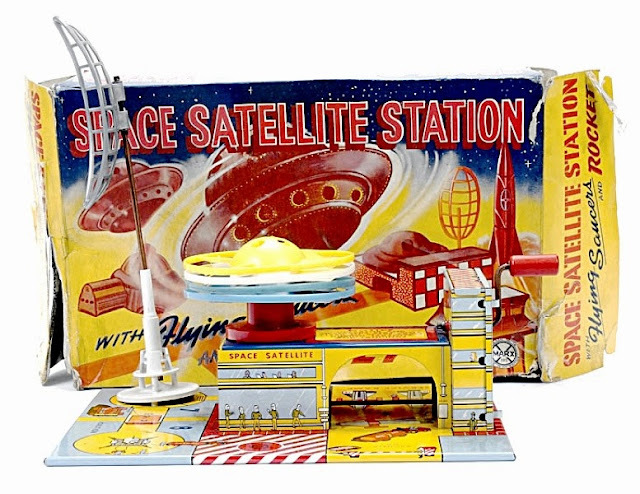 David Jefferis reports: Most of the truly collectible space kits and toys come from the golden age of space exploration, the 1950s and 1960s. 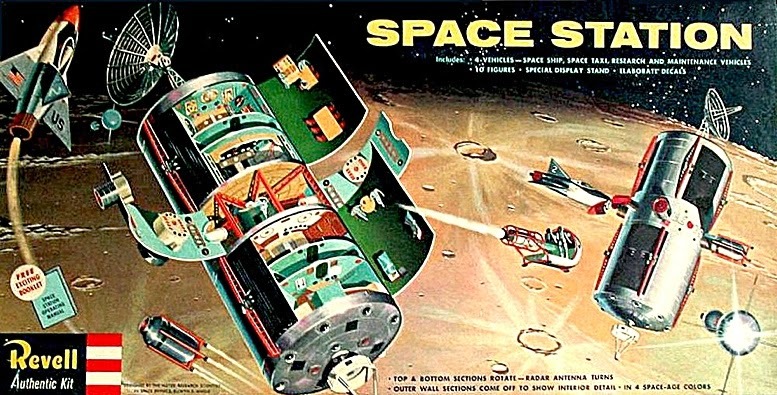 Those Space Race decades were periods of intense activity in real-space technical development, and this headline activity was reflected in the wide range of space toys and kits available to buy in model stores. 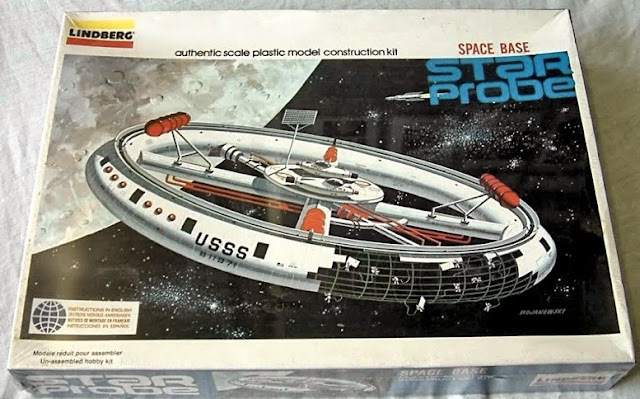 Wonderful stuff, and it has certainly become a classic kit, even if the actual design never left the drawing board, or into lunar orbit, as depicted on the box-top. The Waco toy company matched Revell’s kit with a tinplate version (above, below) which was arguably a sturdier choice if you were giving it to a youngster. The Waco space station had an electric motor to power its ‘new multi actions’, which included ‘stop o go’ action, and ‘run and revolve.’ The top-mounted radar antenna worked, and interior lights could be switched on to display the neat interior, viewable when you slid open hull sections. Waco also suppled a separate delta spacecraft, though this was titled a ‘jet plane rocket’ for some reason. There was also a lunar lander type of spacecraft, both of these being attachable to the station’s equatorial docking ports. All in all, a wonderful tinplate collector’s item, especially if you can find one in fully working order. 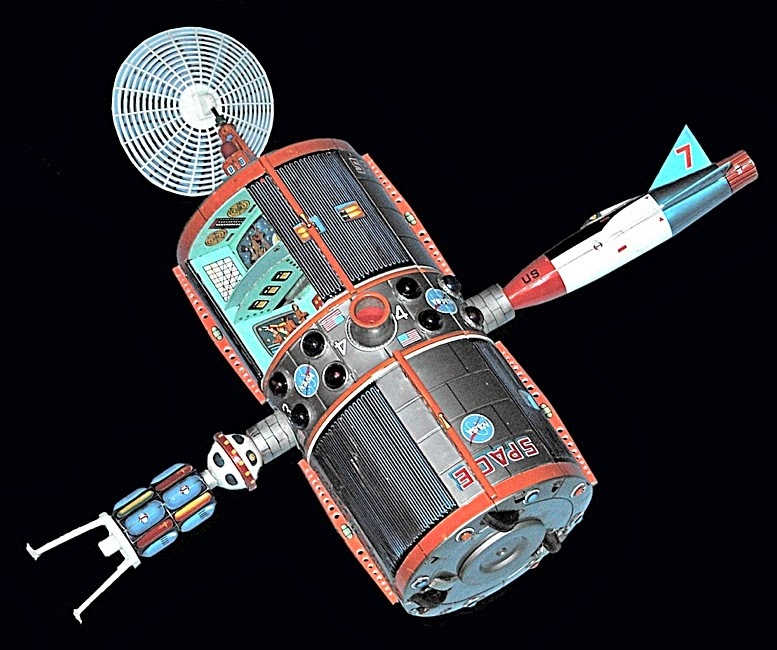 Wheel-shaped space stations were a more advanced design than tin cans, and were generally thought to be the shape of things to come. A rotating design offered the convenience of simulated gravity for onboard crews, and various toy and model companies offered their ideas of how such a space wheel would look. The Lindberg Space Base Star Probe (above) came with decals announcing its operational status as, USSS (United States Space Service) B11971. 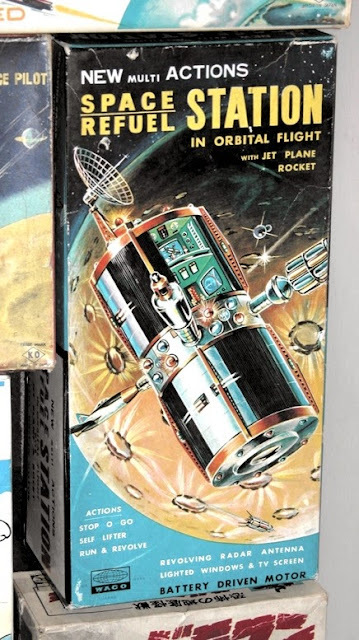 No scale was announced, but the real thing would have been huge, as you can see from the tiny astronauts shown on the box during assembly operations. Lindberg also offered a pair of domed space-taxis, shown parked on the non-rotating landing pad at the station hub. Not as well known as a similar space wheel from competitor company Strombecker, the Lindberg Space Base is nevertheless a highly collectible item. 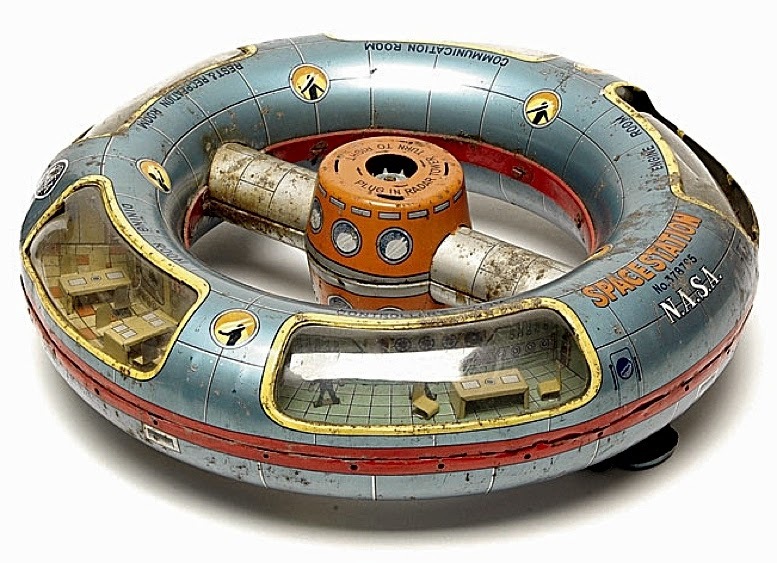 Here’s a similar space wheel design (below) produced in tinplate and plastic. The Space Station No. 378795 N.A.S.A. is a nicely conceived and presented piece of space-age technology. As presented in the toy, all the food in the Dining Room would have shot sideways off the tables. Sad to say, this is not the only time I’ve come across this boo-boo, having once nixed a promising TV script that based its entire plot and action sequences on this particular error. 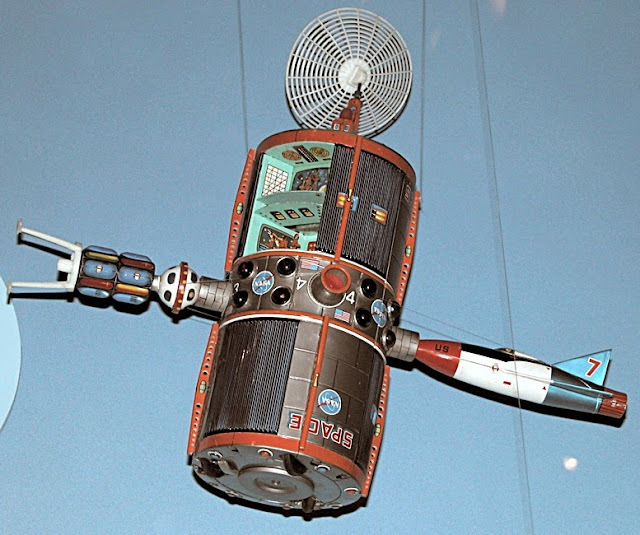 One of the best space toys from Marx (below) was the Space Satellite Station, conceptually a ground-based building that could be used as a launch pad for a squadron of plastic flying saucers. This was a working toy, and at the right-hand end of the tinplate ground station was a handle. You mounted a saucer - one of the group shown in the pic here - and turned the handle as fast as you could, to rotate an axle below the saucer launch pad. The spinning action allowed the radial fan blades of each saucer to lift it off the pad and into ‘space.’ Actually a saucer’s flight was limited to a couple of metres into the air, but for an imaginative young space fan, that short distance became the depths of space for a few seconds of flight. A radar antenna could also be plugged in to the spinner mechanism, as could a rocket. 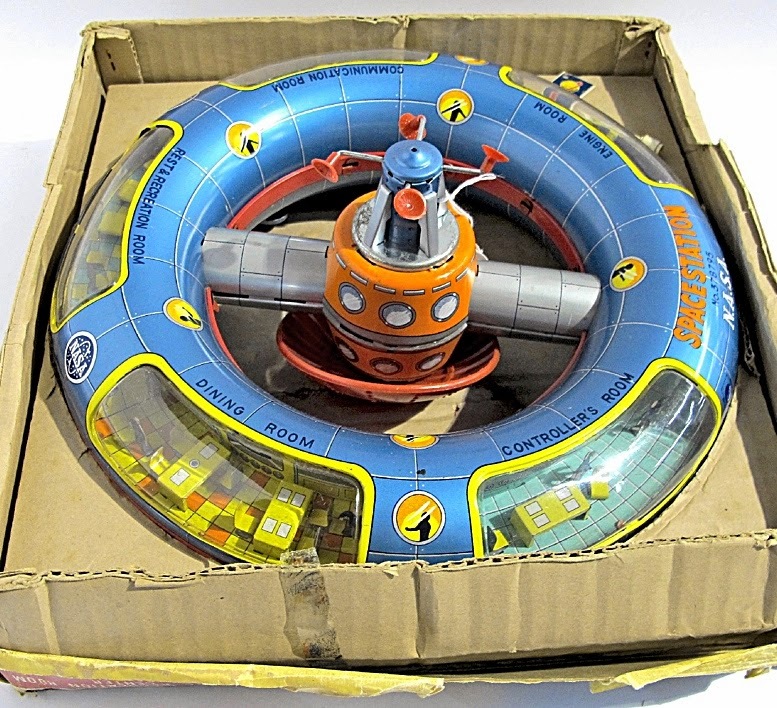 Sad to say, this last item has not survived with the classic toy set shown here.